Rove, Gibbs: How Advisors Can Distance Themselves From Wall St. The storied political spinsters offer some imaging advice at FSI both for advisors and for presidential hopeful Hillary Clinton. Democrats and Republicans aren’t easily brought together these days. But a discussion Monday between former White House insiders Karl Rove and Robert Gibbs — held during the opening session of Financial Services Institute’s OneVoice 2015 in San Antonio — revealed more common ground than controversy. 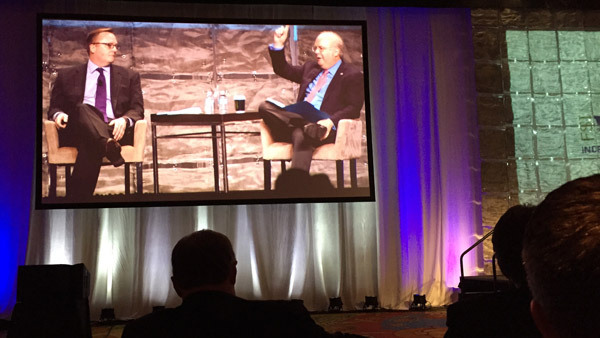 FSI President & CEO Dale Brown asked Rove, former deputy chief of staff to President George W. Bush, about what the industry group can do to separate the image of advisors on Main Street from those on Wall Street — in order to deflect the wrath of politicians. The top lessons learned for both Rove and Gibbs, the ex-White House press secretary and longtime advisor to President Barack Obama, concerned the separation of politicking and decision-making. Even if Obama were to follow Clinton’s lead, “I don’t see both sides finding much in common,” he added. Still, he says that some important issues could get resolved, such as corporate tax reform and trade agreements. “They are unpopular with Democrats but are the right things to do,” Gibbs said. Though the Democratic Party veteran says his party usually has the more spirited personality-driven presidential primaries, he thinks the Republican contests for 2016 should be more interesting. The parties “tend to nominate presidential candidates based on the shortcomings of the current president,” he explained. This makes candidates who have hands-on experience like Gov. Scott Walker of Wisconsin particularly appealing. Both Gibbs and Rove say Clinton will have to move her candidacy forward by explaining her new vision for America and to not focus on the years when husband Bill was in office..
On both the Democratic and Republican side, the playbook has to do more than appeal to special-interest groups, the two politicos said. “You must say ‘here is what I am and what I want to do,’” Rove stated, and spend less time on attacking the opponent.